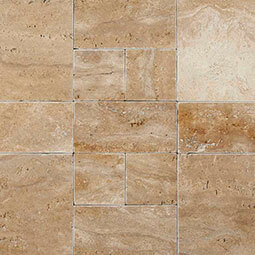 Palermo travertine pavers feature warm creamy beige tones, and the iconic texture and pattern of fine travertine. These travertine pavers are available with a tumbled finish and in 12x24 and 16x24 pavers to allow for creative pattern installations. In addition, mini-pattern kits are available.